London & North Eastern Railway pacific 4489, “Dominion Of Canada” at rest at Exporail in Montreal. The Class A4 Pacific is a sister to the world record holder for Steam Locomotives Mallard, which is preserved in York England at the National Railway Museum. The locomotive was shipped back to the UK in 2012 for the “Great Gathering” of all six surviving A4’s, four in the UK, one in Canada, and one “Dwight D Eisenhower” from the USA. Tis is a bit of a self help/sanity post. One thing that i find can drive you up the wall in model railroading is having too many projects on the go. I know i am bad for this, and that i can be bad for just putting a project to the side and ignoring it. Part of this, is seasonal realities of my living space. At certain times of the year, since my paint booth gets set up on our 12th floor balcony to airbrush, i simply can’t paint. It’s either too cold (Canadian winter), or too humid (Canadian summer). Which leaves me a 1-3 month shoulder in the spring and the fall where i can paint without packing up all my gear and going somewhere else with climate control and ventilation. By it’s nature, this can mean bad timing on a project resulting in months of delay while i simply can’t work on it, but this feeds my problem, that i sometimes spend too much time looking at new projects or things i want to do, and not being focused on what i am doing and building. Part of this though, is just a pure scatterbrain approach to projects given i don’t have an active layout focusing my attention, i get onto a diorama project or something else, and if energy wanes or i run into problems finding parts or supplies, it gets set aside and something else winds up on the workbench. Hopefully this post will become a tie to bring the threads of these projects together when i actually get to writing about some of them. A unique trio which was a 1950’s CN experiment in breathing new life into old gas-electric cars. Theses are also nearing completion, the interiors of the coaches are incomplete, and the underbody details of D-1 haven’t been brought closer to real, but they are presentable. Just need to take some time to put things together and they are done. Shipment of Dominion of Canada locomotive to UK in 2012, in HO Scale. I got sick and tired of seeing models of an A4 steam locomotive in OO on HO scale flat cars, the locomotive was just massive. So i drew up a wire frame A4 to be tarped over, an HO Scale tender and the heavy load flat car it was on to be 3D printed, and modified a 60′ flatcar to look like the car the tender was on. I’d say I’m 75% done this project. I’m stalled on modelling the tarps over the locomotive. I think i know what i want to do, but I’m stalled with inertia of messing it up when i actually do it. No, not the province, the Dominion Atlantic Railway (nee Canadian Pacific, Upper Canada Railway Society & Ossawippi Express Restaurant) car preserved at the Toronto Railway Museum. The 3D print of my first fully 3D printed passenger car should be here this week. Then i’ve just got to get parts for the under body and get building! We rode this fantastic trip on our honeymoon, and at some point I decided to model the train. I’ve got the BR K1 Steam Locomotive and a BCK coach done. I have a kit for the right model of BR Mk1 First Open coach on the way to keep me busy for a while, which will then just leave the other four coaches of the train to acquire and modify to resemble the West Coast Railway Company coaches. This of course says nothing of where i will display or run said train. See the problem here? This project at least i’ve made serious progress on. I’d say the base ground cover and the building’s are around 90% complete. It was good enough that i was happy to display it at a show in February. I’m bogged down on some little fixes, and making trees. These are the first trees i’ve ever made, and i keep getting bogged down on finding a block of time to make a mess and fail a bunch on getting them done. I’ve been converting my apartment test track layout into something with scenery since late 2014. I built a stone engine shed, coaling stage and some NCB wagons and locomotives, but got stalled on ground cover and details and its kind of just sitting half finished on top of a shelf. For some reason scenery is a stalling point for me. Part of the line I’d like to model from Georgetown to Barrie is the Allandale Station at the other end from Georgetown. I’ve got the plans for the building, but haven’t started any work yet on it. I’d like to build a model of the first steam locomotive i remember, Caledonian 419 from Bo’Ness, but only tricky white metal kits are out there. I’d also like a model of Caley Jumbo 0-6-0 812, then I’d have models of all three preserved Caledonian Railway locomotives with the Hornby N0.123 i have. Why i need these, well, I don’t, but i want them, which is dangerous. I’ve never dabbled in Narrow Gauge, but it keeps interesting me. Bachmann released Thomas and Friends locomotives scanned from the Tallylyn Railway’s locomotives. I bought a conversion kit to get rid of the Thomas Face and convert Skarloey into the real Tallylyn, but haven’t bought the locomotive…yet..
See comments above about Narrow Gauge, but i have a really nice model of a Southern Railway T9 and a rural train. Heljan is making really nice looking Lynton & Barnstaple OO9 gauge locomotives, Peco makes OO9 coaches and wagons, and Barnstaple Town was a cross platform connection between the Southern and the L&B which was a Southern owned railway. I have never been there, have no idea where i would find the space for it, but it keeps drawing my attention. The moral of this post i guess is that i think it’s good to have a variety of projects on the go in different stages or with different tasks so you have things to work on, i need to find a way to focus myself on actually finishing things and not finding new projects to pull my attention in different places!! And the sad part is this only lists the projects that would keep me busy with workbench stuff, it doesn’t address a handful of locomotive models coming out that I’d like to buy that are pure display case central material!! 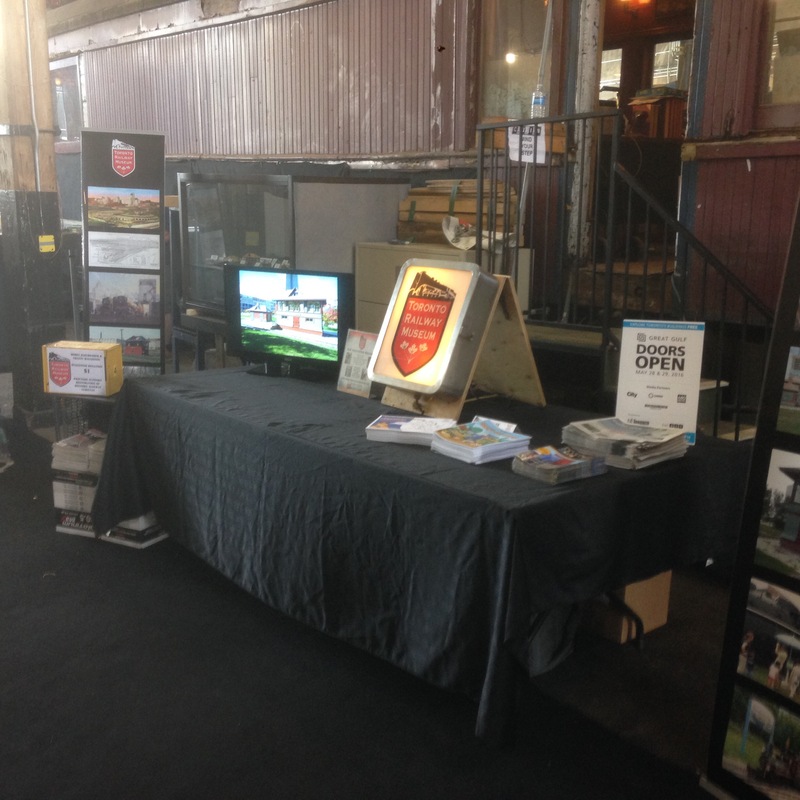 Doors Open Toronto is this weekend, May 28-29, 2016. It is a great annual event where there is a chance to get into many buildings and places not normally open to the public. As is often the case, there are a number of sites of interest to railfans, from The John Street Roundhouse and the Toronto Railway Museum where i will be, to the new TTC Leslie Barns where the new Bombardier Streetcars will be serviced as they arrive and enter service. I will be inside Stall 15 at the Roundhouse, at the TRM Booth in the display area. I will have some of my models of the TRM Equipment collection with me, which pieces are TBD when i get home tonight, but i will have a mix of rolling stock and 3D printed buildings on display. If you are in Toronto and free this weekend, get out and explore your City, the weather is going to be amazing!! One emerging aspect of technology and the Hobby that i have had the good fortune to have the right skills to be at the leading edge of is 3D printing. I’ve been lucky to have learned the right skills to let me engage in this part of the hobby, and over the past five years or so i have experimented and pushed myself to do more detailed and bigger designs, but i’ll get to that in due course following this introductory post on the subject. The first thing to do, is to clear up some misconceptions or preconceptions about what this means. I get looked at like I’m some kind of heathen by so many “old school” modellers when i say i have had something 3D printed, rather than building it out of strips or wood or styrene or brass or whatever. 3D printing isn’t some voodoo black magic, and I’m not a wizard or warlock or any other mystical creature just because i am applying new technology to the hobby and experimenting. Many long time modellers seem to think that there is no skill in building a 3D printed model, or that it somehow cheapens the hobby, which couldn’t be further from the truth in my opinion. In some ways, it may be what saves the hobby, as people younger than me may not come into the hobby by traditional routes, but through the “maker” culture they may be interested in various aspects of the hobby that draw them in further. My friend Trevor Marshall recently spoke at the NMRA Frontier Division convention in Ottawa about this, and has tackled this issue on his blog here, i won’t repeat what he’s said, as its far more insightful than i could be, and isn’t the core point of this post. Back to my point, which is an introduction to my 3D printing and design projects in relation to model railroads. Excluding completely the computer and drawing skills required to create the model and have something to send to 3D print (which is no different than preparing drawings to build a traditional model), what you get back from Shapeways, iMaterialize, the public library, a home printer or anywhere else is far from a finished and ready to go model. It’s a part, and often looks like an incomprehensible blob of plastic until you have cleaned it, painted it, added detail parts, and applied all the other “traditional” modelling skills that you need to know to actually turn the output of a 3D printer into a model worthy of using on your layout. These skills are still needed, as 3D printing is expensive, and wasteful if you use it to print large flat surfaces that could much more easily be done in card or styrene using the 3D print as a frame. This is especially effective on models of buildings, but that’s a discussion for down the road. By way of background, i first learned to use a 3D modelling program in 2000, in a second year Design Studio course in the Urban and Regional Planning program at the University of Waterloo. We were introduced to a modelling program called FormZ, which was used at the university in the Planning and Architecture departments to construct 3D models of buildings or city blocks for projects. While I’ve never been a competent drawer by hand, and now have passable AutoCAD skills, at the time, i had little background in computer graphics, but something clicked, and i readily took to the 3D modelling in university. Sampling of project images from University of Waterloo Site Planning and Design Courses using FormZ. Fast Forward almost a decade from when i graduated university, I started dabbling in using FormZ for scale models in 2012 at my place of employment, as we had bought a copy several years earlier since i knew how to use it. In my day job being able to quickly mock up 3D views comes in handy for projects to do some basic visualizations of proposed buildings or expansion, even at the skill/detail level of a land use planner rather than a full architectural design. Working on 3D models of railroad stuff at lunch and after hours is a good way to clear the mind in the office for when you actually need to be focused on work. At some point, i heard about Shapeways, who are a commercial business set up to bring 3D printing to the people, you upload your designs, and they print them on machines you could never afford for home use. This was the motivation to see if i could use the service to make things i couldn’t reasonably make using traditional methods. I started out working on designs to replicate the 7.5″ gauge live steam equipment at the Toronto Railway Museum. 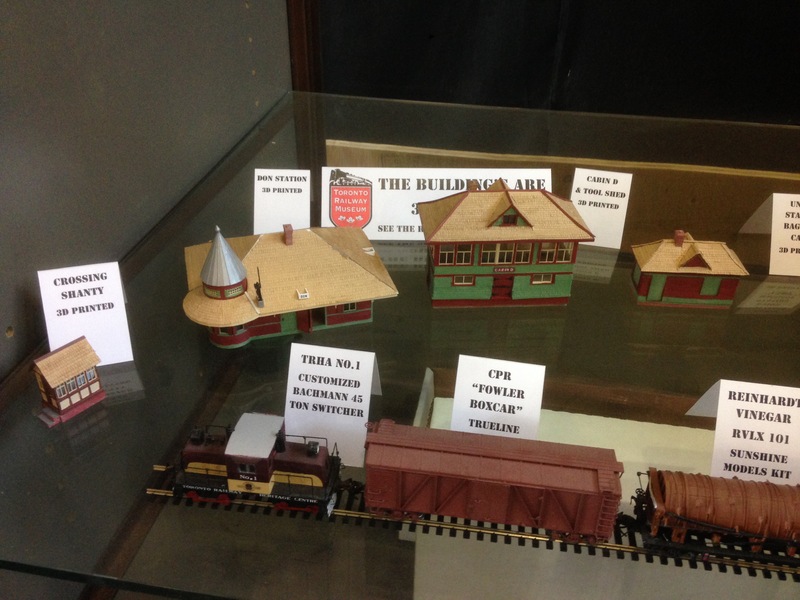 I had been considering building a model of the structures and railway village at the museum, but to do so, would mean a lot of work as nothing was available commercially, none of the structures, and none of the “miniature” railway equipment. Searching online, i found T Gauge track, a Japanese micro scale, which at 1:450th scale equipment is tiny, but more relevant, the 3mm track gauge scaled to 10″ in HO Scale, close enough to be indiscernible from 7.5″ gauge that’s in the park. This plan worked and by the end of 2013, i had what i call my “proof of concept” model that i could in fact model the miniature railway effectively, which meant i could move on to a larger project. I’ll talk more about the larger project later in future posts. 3D Printed 7.5″ Miniature Railway Equipment in HO Scale. 3D Printed in Shapeways “White Strong & Flexible” laser sintered nylon material. Shown unpainted and painted with figures added on a diorama. Having been successful in small parts, my next decision was to try and see if i could apply the 3D printed techniques to something a bit more challenging, creating a custom model of a piece of rolling stock. For the first attempt, rather than build a whole car, I wanted to take a readily available piece of equipment, in this case, a Walthers HO Scale Heavyweight Solarium, and replace all the windows to accurately match the Canadian Pacific Railway’s Cape Race, another car on display at the Toronto Railway Museum. The basic dimensions of the Walthers car are close for the CPR Cape, but the windows along the sides of the car are all wrong, and for a passenger car, that makes all the difference in how it looks. Once i had the Walthers car, i determined that i could cut out the window strip, and design a whole new strip to go into the car. Design, execution and finished product of a 3D printed window strip for a Canadian Pacific “Cape” solarium car. Having the luxury of access to the actual Cape Race car at the Toronto Railway Museum, I was able to physically measure the actual car to get window spacing, dimensions and other relevant details to do the design. Black Cat Publishing make decals for the CPR Cape series cars, which made finishing the model easy. Traditional techniques to construct a new roof (the Walthers roof has an air conditioning duct down one side that the CPR cars did not have). With the knowledge that these “easy” projects were achievable, and having taken the time to learn and understand the limits of what can and can’t be printed by Shapeways in their different materials, I have moved on to much larger and more complicated projects, but that is a future post. A different view of a VIA Rail “J” train running between Toronto and Brockville. This view is from the dome of a Skyline car, on the rear of the train as a special charter organized by Rapido Trains in October 2015. The chartered cars were on the rear for a Sunday Toronto-Ottawa-Montreal and Monday Montreal-Toronto runs, with a visit to Exporail for a product launch event on the monday morning. It was a great time and a rare chance to see the corridor from a dome car. A two-for on Tuesday Train, two GO Train’s heading toward Union Station during a weekday rush hour. One with a new MP40 Locomotive and new Cab Car on the rear, and one with an old F59PH locomotive on the front, and an old style cab car on the rear. Metrolinx/GO transit has replaced most of their F59PH’s with the newer more streamlined MP40’s, and are doing the same with the older cab cars, replacing them with new cars with a full width crew compartment and better crash safety for their crews.